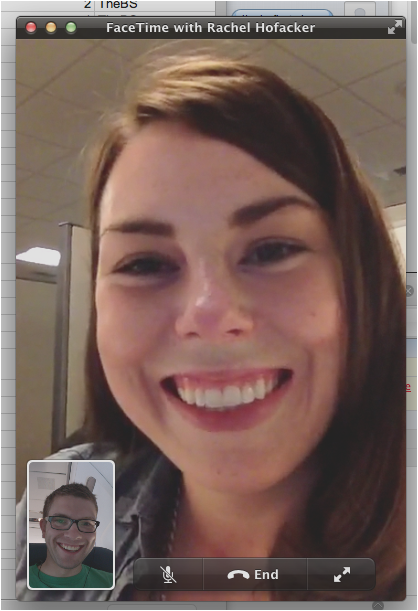 Welcome to the future, where I can video chat with my fiancée from my computer on an airplane flying at 38,854 feet and going 562 mph to her cellphone while she’s on the 8th floor of her office building. That’s what I call awesome (minus the fact that I have to be away from Rachel for a week). Mark your calendars for Sunday June 16, 2013. Rachel and I signed up for Tough Mudder Colorado 2013. This should be good as long as we can handle the hot, dry Colorado summers and get acclimated to the altitude quick enough. Last time I was in Colorado, I hiked a 14ner and ended up suffering from altitude sickness, which—while an interesting case study in how my body works—was not fun to deal with. Welcome to our website! How exciting is this! Our hope is that this place can serve as a central location for our friends and family to keep in touch with us as we go about life. We have big plans, and we want to share them with you. Initially, this site is going to be very wedding focused. In the coming weeks, you’ll be able to find all the information you need about our wedding (don’t worry, we will still send out physical invitations as well). Starting at the beginning of next year, we’ll archive all the wedding stuff and transition things to more of a life blog (whatever that means). If you were a reader of my previous blog adventure, Andrew Ferguson dot NET, I’m going to be blogging about life over here and technical things over there. You can look at the byline to see who wrote what post. Andrew will post as Andrew and Rachel will post as Rachel. This is our blog. We reserve the right to censor, edit, redact, and modify stuff on here as we see fit, this includes comments left by others. We will try our best to make note of when we edit someone else’s comment. This weblog does not represent the thoughts, intentions, plans or strategies of our respective employers (or any other organization we might have a vested interest in).